Spring is right around the corner and the sun is setting later! We’re all anxious to be outside after spending so much time indoors. Warmer weather and brighter evenings inspire friends to hit the outdoor cafes for a happy chatter and a cool happy hour drink. But while you’re sipping, remember bathing suit season is just months away. So, how do you socialize without gaining weight? Here are a few suggestions. Steer clear of high-calorie fruit drinks. The average candy bar has about 29 grams of sugar. The strawberry daiquiri mix alone has nearly 40 grams of sugar! That is nearly triple your daily recommended amount of sugar? in just one drink! Add to that an ounce of rum and you are looking at a drink that has over 200 calories and 40 grams of sugar. If you are craving something sweet, why not try flavored vodka with soda instead? You can have an orange vodka and soda and it will only set you back about 70 calories. Come June, you’ll be happy you made the switch. Opt for freshly-made margaritas, instead of frozen pre-mixed. If you absolutely must have a margarita, then avoid the gigantic frozen, Cancun-type of ‘rita and have the bartender mix you up the original. 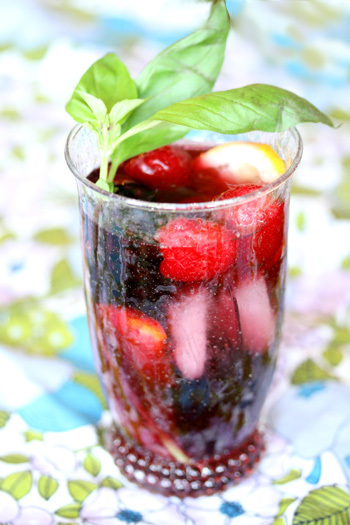 Not only is it refreshing, but it will also save you sugar and calories! Or you can make a heart-healthy Pomegranate Margarita right at home. Watch out for those free-floating bar snacks! Bars love to supply their guests with salty treats like beer nuts, peanuts, sesame Asian mix that make you drink more – good for them, bad for you. Instead of thinking “why not, they’re free,” keep in mind that they’re not calorie or fat-free. Besides the hundreds of unnecessary calories, sharing isn’t always a good thing. Avoiding bar snacks where unwashed fingers roam – helping keep away that pesky Spring cold you seem to catch every year. Beer lovers rejoice! Just because you are watching your carb intake, you can still have your brew. Many light beers are under 110 calories and have under 6 grams of carbs. Plus, you have the added bonus of portion control – you know exactly how much you are getting in that bottle! When all else fails, try old reliable – white wine. When I just can’t tell what’s in those sugary pink cocktails, I know that you can’t go wrong with white wine. At about a 120 calories a glass and less than 7 grams of carbs. Check out my Healthy Happy Hour recipe spread in the July 2008 issue of Self. Concerned about carbs? Read more about ways to cut down on carbs. Could that fancy cocktail have more sugar than a dessert? In this video segment, you’ll find out which drinks can pack on the pounds, as well as easy ways to lighten them up. Try my fruity Papaya Lime Cooler for your next cocktail party. It’s low in processed sugar and high on taste. Bloody Mary is perfect for spring brunch. Fresh grated horseradish adds extra zing!